The 'Twilight' hunk has likened the mass interest in his split from Kristen Stewart to the public's obsession with the British royal family and thinks he's being held to an elevated status in the media. Speaking at the TimesTalks Presents: David Cronenberg and Robert Pattinson event at The Times Center in New York, Robert - who was born in London, England - awkwardly mused: "I think it's because America really wants to have a royal family. You want to have a democratic royal family. It's a meritocratic version of it, sort of, actually, no it's not at all." TV host David Carr replied: "So if you and [Kristen] have trouble, it's like [Prince] Charles and Di [Princess Diana] having trouble." The crowd responded to the controversial remark with boos and hisses, but David joked: "I wasn't really going there, just so you know." Robert - whose girlfriend's affair with her married 'Snow White and the Huntsman' director Rupert Sanders has been highly scrutinized in the media - looked embarrassed and muttered that he "wouldn't go that far" as to compare himself to the Prince of Wales and the late princess, who died in a car crash in 1997. 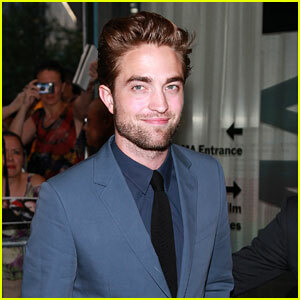 The 26-year-old actor was promoting his new thriller 'Cosmopolis' with director David Cronenberg.